Our newest pamphlet, published in 2015. 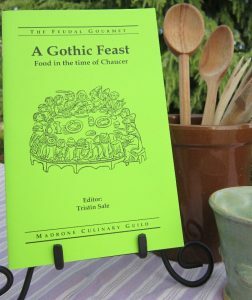 This work focuses on late 14th century English and French sources and contains 18 mouthwatering recipes. The pamphlet also provides a thorough introduction to the time period and cuisine, including a survey of contemporary literature references. Among these recipes you’ll find our versions of Quenelles (meatballs) and Cretonee of new peas.